Canine Cognitive Dysfunction is an Alzheimer’s-like condition occurring in some aging dogs. Dogs experience dementia, changes in personality and general confusion. For many pet owners, it is difficult to recognize the differences between normal signs of aging and canine dementia. 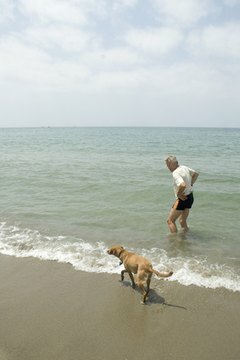 As dogs age, they commonly slow down, experience temporary bouts of confusion and experience difficulty with agility. However, dogs that experience changes in personality and severe confusion might be developing dementia. There are several symptoms that indicate a cognitive change in senior dogs. Dogs that appear to experience confusion, less responsiveness, changes in social behavior and changes in personality may be developing dementia. Other symptoms include not recognizing familiar people, not responding to the name, getting lost in familiar areas and barking for no apparent reason. It can be difficult for a veterinarian to diagnose Canine Cognitive Dysfunction (CCD) or dementia, according to the Native Remedies website. It is important for pet owners to document odd behaviors, changes in personality and other symptoms. Bring all the documentation to the veterinarian to help make a proper diagnosis. Though there are no specific cures for CCD and canine dementia, there are several herbs and other natural treatments that may be administered by pet owners. Many herbal treatments are designed to improve overall cognition, making life for an aging dog a bit easier. Rosemary is one such herb, according to the Native Remedies website. Rosemary helps improve memory, increases energy and slows the effect of free radicals on the body. Dogs given rosemary-rich foods or herbal supplements may experience improvements in cognition and energy. The herb Gotu Cola may also help treat symptoms. Gotu Cola helps improve the flow of oxygen of the brain which may aid memory and mental awareness. There are other natural supplements that might help improve a dog’s ability to function, its memory and its energy levels. The Vet Info website recommends providing dogs with dementia a vitamin B choline treatment. Supplement brands, such as Cholodin, are beneficial to a dog’s memory, mental status and awareness. Look for dog foods fortified with antioxidant blends which are design to counteract dementia. According to Vet Info, reports have shown that dogs on a prescription dementia diet show a 74 percent decline in household accidents after 30 days. The Doctors Foster and Smith website states that changes to a dog’s home life can help them feel more comfortable. Eliminating clutter, building ramps for steep stairways, and developing a walking, feeding and watering schedule helps improve a dog’s ability to cope with dementia. Dogs may also benefit from playtime with interactive toys. Introduce new toys, environmental changes and people slowly.